Spring is almost here! We’re beginning to enjoy the longer days and sunshine (albeit, some places Grandfather Sun is showing his face more than others.) I was recently looking for some guided meditations for celebrating the Spring Equinox for our other blog, Shaman’s Blog, and came across this nice, easy grounding earth meditation by Patti Wigington at About.com. It seemed very appropriate to share here at Nature Wise. Often in our fast paced urban lives we become disconnected from the Earth. When we aren’t “grounded” we can find ourselves feeling scattered, spacey, out of balance and just not in tune with our lives. This is an easy grounding meditation that can be used any time to help you reconnect. Don’t let the directions to be outdoors and directly on the Earth keep you from enjoying this meditation. It would be great if you can find the quiet time and place to enjoy this outside, but if that’s not possible, put your powerful imagination to work and visualize yourself in your “Nature Spot”. Then, continue with the rest of the meditation. “Try this simple meditation to help you attune to the element of Earth. To do this meditation, find a place where you can sit quietly, undisturbed, on a day when the sun is shining. Ideally, it should be in a place where you can really connect with everything that Earth represents. Perhaps it’s a hillside outside of town, or a shady grove in your local park. Maybe it’s somewhere deep in the woods, under a tree, or even your own back yard. Find your spot, and make yourself comfortable. Sit or lie on the ground, so that as much of your body as possible is in direct contact with the ground. Use all of your senses to attune to Earth. Relax your body and breathe slowly, through your nose, and taking in the scents around you. You may smell freshly cut grass, or damp earth, or flowers and leaves. Close your eyes, and become aware of the earth beneath your body. Feel the cool breeze blowing by, and allow yourself to become in tune to the rhythms of nature. Once you are completely relaxed, focus on the warmth of the sun on your face. Imagine that warm golden light being absorbed into your body, through your third eye. Feel the light of the sun warming your head and face, a little at a time, just as the earth is being warmed back up. Imagine this light working its way along your body, traveling through your neck, down into your chest, where your heart chakra is located. Allow it to warm your heart, then traveling slowly down through your abdomen and down to your root chakra. As this light warms your body, feel it connecting you to the ground beneath your body as well. Imagine this warmth spreading, a golden glow journeying along your legs, your knees, and finally to your feet. By the time the sensation reaches your feet, you should feel as though your entire body has been infused with the warmth and light of the returning sun. This is a great time to have a chat with Mother Earth and ask her assistance in helping you to stay grounded and connected. 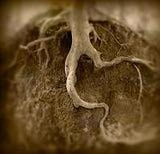 When you feel ready, slowly return to the here and now, keeping your roots connected deep in the Earth. Enjoy your visit with Mother Earth. This entry was posted in The Elements - Earth/Air/Fire/Water on March 18, 2014 by Debbie.